Although the origins of terrazzo go back to ancient Egypt, the material as we know it today was developed by builders in Venice, Italy, as a low-cost flooring option. 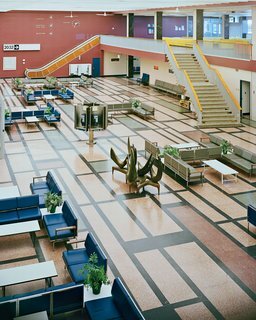 The international transit lounge at Gander International Airport in Gander, Newfoundland, and Labrador, Canada, has retained its midcentury, Mondrian-esque terrazzo floor. Recently, terrazzo has seen a major resurgence, but with a bit of a modern twist. Bolder and brighter colorways are being employed, larger pieces of stone are being used as aggregates, and it's now being used to make furnishings and home accessories. It's important to note that the process presents the chance to incorporate color—a fact that modern-day manufacturers have been taking advantage of. The main living area of this home features Venetian terrazzo flooring. 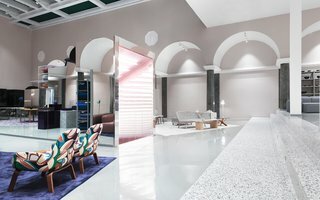 What is terrazzo and how is it made? Terrazzo, which is Italian for terrace, is the name it was given by the Italians who developed it. It's a composite material made of chips of marble, quartz, granite, glass, or other stone, and is held together with a concrete or epoxy-resin binder. 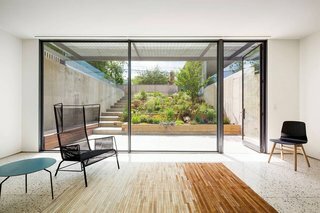 A weighted roller finishes the material, and the terrazzo is ground and polished to produce a smooth surface. Today, most terrazzo is epoxy terrazzo, which allows for a wider selection of colors, faster installation, and a stronger, thinner material with an impermeable finish, making it less susceptible to cracking. For Vienna Design Week, QWSTION asked Terrazzo Project (TP) and Schoenstaub to create a coordinated collection of tables and carpets. Although terrazzo is currently considered to be a luxury finish, it was actually created to be a budget-friendly solution. Current technological advances have taken terrazzo beyond just flooring and into countertops and backsplashes—a logical extension. 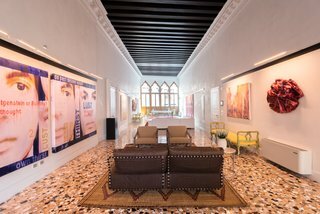 The use of terrazzo flooring creates a slightly retro-glam look. In this remodel, carpeting was traded for a more updated look with the use of terrazzo flooring. 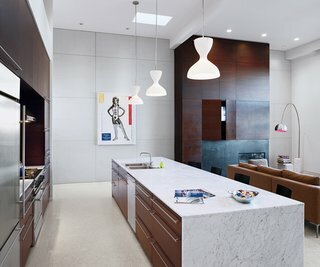 When Nilus De Matran renovated this San Francisco kitchen 10 years ago, he chose materials that would stand the test of time while complementing and unifying the open space, which is filled with dark walnut, terrazzo flooring, and Carrara marble. 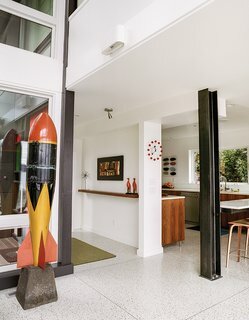 A slab of terrazzo was used for this kitchen countertop, which features Bulthaup fittings. 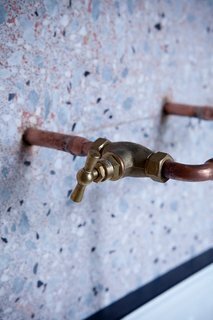 Copper piping for faucets extends out from a terrazzo-covered bathroom. 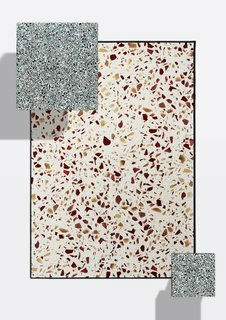 In addition to its distinct look, terrazzo is durable, low-maintenance, and can add a luxurious feel to your space, but what makes the material so special is its customizability. However, it can be a pretty pricey flooring option and installation requires a professional. Terrazzo steps lead into the ballroom in Normann Copenhagen's showroom. 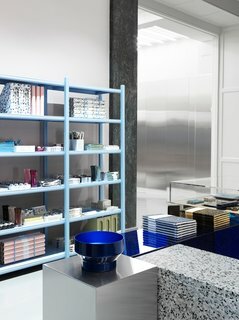 The showroom's display podiums are made of mirrored glass, steel, acrylic, and terrazzo. What are the different uses of terrazzo? With the speckled material becoming more and more popular, we've seen it used to make furniture, lighting, and decor. Some designers have also come up with their own special creations that are clearly inspired by the material. 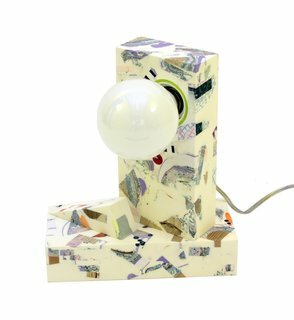 Chen Chen and Kai Williams' Gingko Lamp combines urethane resin, wood, fabric, and acrylic in a terrazzo-like creation. 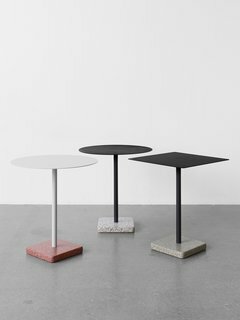 A distinctive terrazzo base is the defining feature of this table designed by Daniel Enoksson, which is appropriate for both indoor and outdoor settings. 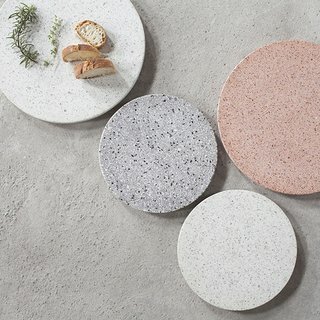 The Terrazzo Platter from Serax is a sophisticated kitchenware accent and can be used as a serving tray, a board for cheese and charcuterie, or even as a centerpiece on a dining room table. 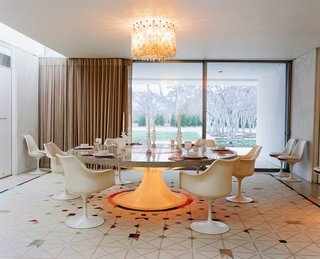 This dining room is centered around a custom Eero Saarinen-designed, marble-and-terrazzo table that's surrounded by Tulip chairs. A Venini chandelier hangs overhead. Marmoreal is an engineered marble for architectural surfaces developed by the British company Dzek in collaboration with the British designer Max Lamb. Offered in either a black or white finish, it uses marble as the aggregate. 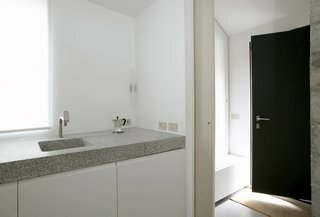 However, it contains much larger pieces of rock than terrazzo does, giving spaces an even more modern look. The public spaces of The Laylow in Waikiki are filled with both vintage furnishings and custom designs by OMFGCO. 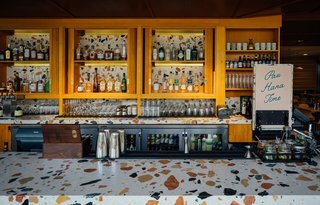 The Hideout bar features a Marmoreal countertop, which consists of an engineered marble developed in collaboration between Dzek and Max Lamb. 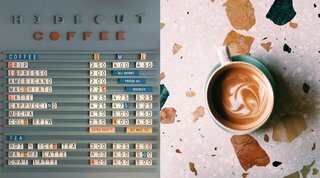 Hideout Coffee serves brews all day from Stumptown. It’s shown here on top of the Marmoreal countertop.